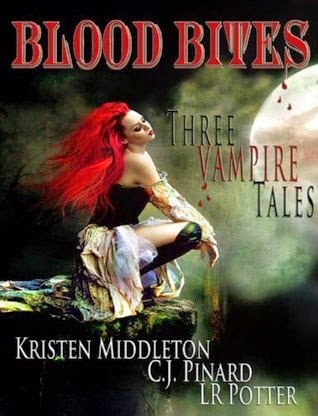 From Goodreads.com: Three vampire tales by three talented female authors! College sophomore Evan Grant doesn’t realize what he’s getting into when he asks the beautiful redhead, Karina Walsh out on a simple date. The date ends well but the night does not. A frightening encounter with an otherworldly creature leaves him nowhere to go but to Karina and her family for help. But will they help him… or destroy him for knowing too much of a world he never should have seen? After some of the heavily detailed books I have been reading, I was looking forward to a collection of short stories. The fact that they were all vampire themed was just an added bonus. However, for the most part, I would have been better spending my time cleaning my house, or doing laundry... or basically anything other than wasting my time with this (with the exception of The Blood Pool, but we'll get to that in a minute). The first two books left much to be desired. They moved so quickly (even for a short story), that I couldn't care less about the characters of their plights. The concepts were solid enough that each of these stories could have been turned into a full length novel and probably been well done at that, but these stories as they stand are dreadful. Aside from the characters being one-dimensional, the stories were so drawn out that by the time they really started getting interesting, or a twist was revealed, BOOM the book was OVER. I will say that each of these stories did have a unique twist that I found interesting, I just wish there would have been more for me to review. The last novel in the collection, The Blood Pool, was not only my favorite, but was in my opinion the most well done of the three. There was character dimension, there was loss, there was love, there was drama & suspense. It had everything that I desperately wish the other two had contained. The two main characters each had suffered the loss of someone they loved, and despite their different circumstances, they were still able to come together and overcome the odds. I also enjoyed the twists contained in this story, it wasn't something I expected, and that made it all the more enjoyable to me. I would read more by this author if not from the other two.